Big bowl size 16.9" X 17" X 10"
Small bowl size: 12.9" X 17" X 10"
Kitchen sinks have been evolving ever since their introduction to the market decades ago. Double-bowl sinks are proof to their evolution. 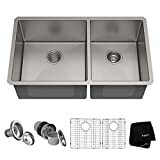 So, to help you pick one of the good ones, we present to you our Kraus KHU103 Double Bowl Kitchen Sink Review for your convenience. The Kraus Double Bowl Kitchen Sink’s double bowl allows the sink to have a dual-purpose usage. 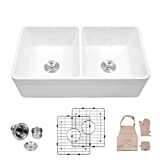 The entire sink is large and deep enough to offer you plenty of space for efficiently cleaning up dishes, or other activities you would usually do on a kitchen sink. The entire sink is unique in a way. The KHU103 is durable. The sink is also designed in a way that would make it very easy for you to maintain. It easy to clean up with the help of its curved edges. The sink even has a noise cancellation system that eliminates most of the annoying sounds that water would make as they drop from the faucet. 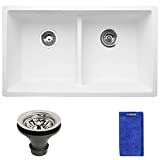 Now let us guide you further into the sink’s specifications in this Kraus KHU103 Double Bowl Kitchen Sink review of ours and help you understand what makes this kitchen sink so special. The asymmetric widths of the sinks allow the bowls to have a set, varying purpose for each bowl. The bowl on the left is 16.9-inches in width, and the left bowl is 12.9-inches in width. Both bowls are large enough for large cookeries like stockpots to fit inside both bowls. Both bowls are 17-inches long and 10-inches deep. 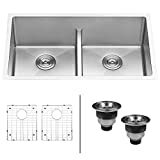 The sink’s body is made up of 16-gauge premium grade T-304 stainless steel construction with an 18/10 nickel/chromium composition. 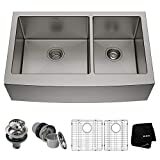 This makes the entire sink highly durable and resistant to corrosion and dents. The body also comes with curved 0.75-inch edges that are much easier for you to clean. The sink is given a commercial-grade satin finish that gives the sink a fine sheen that will not fade away. Meaning that the sink will not lose its sheen, AND it is resistant to scratches. This gives your sink a luxurious look for as long as possible. The sink has a NoiseDefend system that allows the sink to be silent. The paddings and undercoating absorb 80% of the vibrations that are created from using the kitchen sink, making the sink eliminate most of the unwanted sounds that would out when you would use a typical sink without the sound-proofing system. The 3.5-inch drain opening is located further in the back of each of the bowls instead of being placed in the middle. This allows fluids to trickle down the drain without getting blocked by the cookeries if they are placed on top of the drain opening. 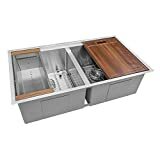 As seen in our Kraus KHU103 Double Bowl Kitchen Sink review, the Kraus Double Bowl Kitchen Sink has hardly any drawbacks. It is a beauty to look at, it is made of highly durable materials, and it gives your entire kitchen a nice overall look. The sink also requires little maintenance to keep it shining and in a working condition. In this review of ours, we hope that we have managed to give you a clearer idea of the features that make this kitchen sink stand out from most sinks you would normally see in shops. 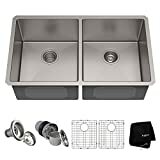 For those who expect to own a kitchen sink that looks and works great and takes up little maintenance to keep it functional, this sink might be the right choice.